Stunning Willowbend home with sparkling pool and spa overlooking a tranquil lake set in sunny southern exposure. Unique paver drive adds to the curb appeal with maintenance free landscaping included in the low HOA fees that also covers high speed internet and cable, community pool, gym and pickleball court. Custom double door entry brings you into a home that is inviting and energizing. Many features combine to aesthetically please: 8ft. doorways, abundant crown molding, bamboo flooring, plantation shutters, tray ceilings, glass blocks and built-in entertainment in Family room. Chef’s kitchen in granite, solid wood cabinetry & natural gas range. There is an additional den/office in addition to the 3 bedrooms. Outdoor living is as compelling as the indoor, a serene lake to view wildlife and birds with a stylish geometrically designed heated pool and spa and handy immediate access to the master bath. On a practical note: easy install hurricane shutters throughout for peace of mind. Minutes to downtown Sarasota, Venice, Pine View School, the finest beaches, waterfront restaurants & tiki bars and a brand-new Publix nearby. Please, send me more information on this property: MLS# A4431153 – $473,000 – 1271 Thornapple Dr, Osprey, FL 34229. 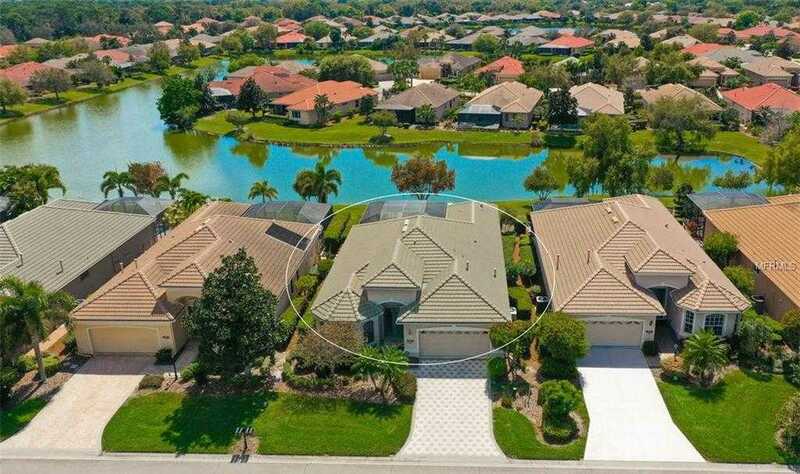 I would like to schedule a showing appointment for this property: MLS# A4431153 – $473,000 – 1271 Thornapple Dr, Osprey, FL 34229.